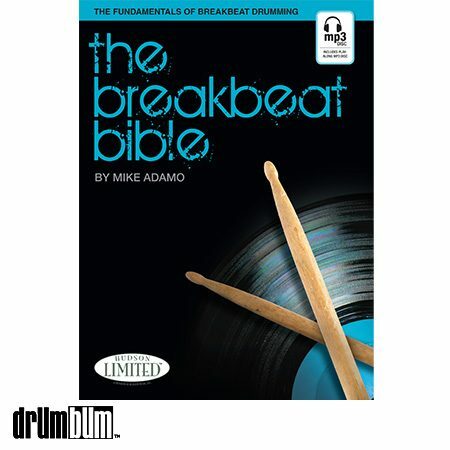 The Breakbeat Bible Book/CD – The Fundamentals of Breakbeat Drumming – The most in-depth study of breakbeat drumming in print! The style is divided into thirteen essential elements, with each element discussed in its own chapter. Hundreds of exercises and beats give the reader ample opportunity to practice the elements, which, when assembled, will give the drummer the ability to integrate a complete language of incredibly funky concepts into his or her playing. Over 90 transcriptions of beats and breaks provide the reader with a window into hip-hop/breakbeat drumming. Included are some of the most sampled beats in music history û including information about the original song and later songs that used the sample. Also included is a historical overview of hip-hop and breakbeat drumming, as well as biographies of many of the “architects” that helped design the culture. The “Click Track Loops” chapter provides an incredibly challenging system for practicing the breakbeat/hip-hop elements and other grooves against various patterns programmed into a drum machine. These will help the reader get to the next level of tightness, precision, and groove in their drumming. The CD features MP3 files with examples of select exercises, beats, and eight-bar phrases from the book. It also contains five play-along instrumental tracks (with and without drums). There is also a bonus sample library featuring 30 individual drum/cymbal sounds. Bonus Sections include Beats With Drops, Fills, and Dubstep. Softcover Book approx. 9″ x 12″ and 180 pages.